What was the Grand Masters Tour? The North American hardball Pro Tour (WPSA tour) that had developed rapidly in 1979 and thrived throughout the 80's was defined by an exciting brand of fast, attacking squash and especially by a group of interesting, charismatic, and contrasting personalities. These included great North American players such as Gordon Anderson, who could hit the ball harder and at more angles than anyone else, and always enjoyed doing it, Clive Caldwell, serious and with few weaknesses, Aziz Khan, always on the verge of greatness but not quite able to capitalize on it, Mo and Gul Khan, not fit or serious enough but with incredible racket control and definitely crowd favorites, and of course Sharif Khan, unassailable champion of the hardball court. It was these competitors who were the favorites of crowds, sponsors, and the press, so as players like Mark Talbott, John Nimick, Ned Edwards and Greg Zaff gained dominance in the mid 1980's, the sport lost some of its personality. In that context, the Grand Masters Tour was created, a way to give the aging stars an ongoing stage and, played alongside the main WPSA events, keep the personality in the sport. It was a short-lived but fascinating tour and Rob Dinerman memorializes the second of its two short years of existence here. The 1990-91 Prudential-Bache Grand Masters Tour featured an expanded tournament schedule, the emergence of a number of different faces in the winner's circle, and a riveting rivalry for the top ranking that wasn't resolved until the final months of the season. The effort and excellence of legendary figures in the history of North American squash generated a compelling mixture of competition and comraderie that made for an especially memorable campaign. The dynamics of the Grand Masters tour differed markedly from those of the Open division, and were substantially molded by the environmental backdrop to its composition. Created specifically for top players age 35 and over, this tour consequently consisted largely of individuals who had been part of the WPSA Tour scene for a decade or more, with the top-level competitive history in some cases approaching a quarter century (Sharif, Mo, and Gul). Furthermore, most had enjoyed careers not only of considerable duration but also of distinction: indeed, several continued even in 1990 to be impact players on the Open circuit, a duality allowed by the fact that four of the six Grand Masters events were combined with existing open events the prior season. No fewer than eight active players on the 1990-91 Grand Masters tour were top-fifteen rated players on the Open Tour ten years earlier, in the spring of 1981, which is especially impressive when one realizes that five others of that top fifteen group were not yet age-eligible for the Grand Masters tour. It was that elite group of the early 80's --- led by charismatic star, Champion Sharif Khan and workaholic past WPSA president Clive Caldwell --- which not only dominated but also revolutionized professional squash, for it was during their era --- and as a result of their efforts --- that a pro tour of impressive scope and legitimacy truly developed, and in many ways provided many of the ideas for the current PSA and WISPA tours. PLAINFIELD, NEW JERSEY...where the group had the field pretty much to themselves, the Open portion of the New Jersey Open being held at the Chatham Club, several miles away. The Friday evening schedule of quarter-final matches was attended with an element of anxiety caused by the delayed arrival of Sharif Khan, by far the most worthy of the "Legends" moniker that adorned the tour's promotional posters, and hence even with his actual second echelon (number five) current Grand Masters ranking, the main attraction. Tournament Chairman Gary Hamrah was worried not so much with the possibility of Sharif not appearing, but with the default related protocol of his late arrival, a concern swiftly allayed by Sharif's upcoming opponent Dave Talbott, who assured Hamrah that one of the sport's unbreakable codes was that "you don't default the Sheriff." Talbott's affectionate and deferential acknowledgement of Sharif's special stature did not carry over to their actual match, a hard-fought four-game battle which the victorious Talbott followed by assuming a 1-0, 14-3 lead Saturday morning against Sharif's younger brother Charlie, who couldn't find his game and remained error prone throughout the disastrous second game. Luxuriating in the safety of such a huge margin, Talbott dropped a point or two, then a point or two more, enough to spark his foe's dormant game, which created a higher level of crowd response, causing fear to arise in Talbott: Would you believe Charlie WON that game?? 15-14, 12 game points saved, and a brand new match, though Talbott, to his credit after such a shattering contretemps, righted himself and controlled the remainder to earn a spot in the final against Clive Caldwell, winner of all but one of the 1989-90 Grand Masters events and victor in the season's opening tourney, in Atlanta, one month earlier. Caldwell's semi had been with Aziz Khan, Sharif's younger brother, whose route to that juncture had almost been snuffed out by Tom Rumpler, a teaching pro par excellence who was singlehandedly responsible for the Prudential Bache umbrella sponsorship that was the lifeblood of the tour's existence. This salesmanship had gained Rumpler the appreciation and gratitude of his higher-ranked peers, all of whom were hopeful that Tom's self interested altruism would be rewarded with a breakthrough win, so long as it was at someone else's expense. Against the heavily favored Aziz (an easy winnner in their first-round Atlanta tilt), Rumpler played beautifully in earning a fourth-game-match-point opportunity but the cool he had displayed up till then vanished at that juncture, as he badly mishit an open ball, froze on a gettable Khan roll-corner response and fell too far behind in the anticlimactic fifth game to have any hope of catching up. Relieved by his narrow escape but still slightly out of synch, Aziz subsequently bowed in three to Caldwell, who then saw a big lead in the finals dissolve in the face of Talbott's determined retrieving and powerful groundstroking. These strengths brought David his first Grand Masters Tour win since the 1989 WPSA championships (also over Caldwell) and set the stage for a New Jersey "Family Double" that his younger brother, Champion Mark, would complete by winning the Open event the following evening at Chatham. David's win was testament to his durability over the years, and he seemed to be thriving as he approached forty, achieving success against the top five he hadn't been able to muster in years past. TORONTO, host site as always of the Canadian Open, where defending champ Caldwell would receive yet another turn of the final-round screw. The routine nature of Caldwell's path past a tentative Tom Rumpler and an injury-nursing Aziz Khan (whose back pains forced first a mid-match twenty-minute play stoppage and finally a default at 4-9 in the fifth game) was balanced by disorderly doings in the other half of the draw, ignited mostly by the injury withdrawal of Atlanta semi-finalist Larry Hilbert one day prior to his scheduled first round match with Sharif. If the injury to the normally fit Hilbert spelled a break for Sharif Khan, it constituted a resurrection for Rob Dinerman, who had already returned to New York following his ouster in the qualifying round play several days earlier. Lucky-loser Dinerman gladly returned to Toronto and opportunistically sharp-shot his way to his first career win, and in straight games at that, over Sharif, whose generous participation in a pro-am doubles match earlier that afternoon left him too tired and gimpy-legged to come up with a representative performance at the Sheraton Centre that evening. In the semis the following night, Dinerman squandered a 14-12 first game edge over Charlie Khan and never contested the match thereafter. 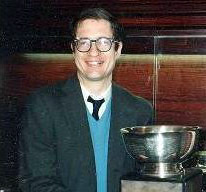 Charlie Khan had won the WPSA Grand Masters event in New York the previous May, and had been Caldwell's finals opponent in Atlanta the month before, but few were expecting the manner in which he would follow a match-tying second-game overtime win by dominating the final two games (6 and 9) of the final against Caldwell this time in Toronto. CHICAGO, that was the midseason of the tour and Caldwell's chance to re-establish a top position. There was a new-found balance in the Grand Masters in 1991, that had resulted in three different winners at the three tourneys so far. After sweeping through the first four events in 1989-90, the putatively invincible Caldwell (still a top-ten ranked player in the WPSA open tourn) had now won only one of the last four events; and had slipped to number two. Chicago also brought to the surface the disadvantages of holding the Grand Masters events concurrently with the main WPSA pro tour events. The tour was considering breaking the Grand Masters events off, in order to put the legendary players center-stage to a greater degree, more fully service the promotional profile of the tour sponsors, and distance the older players from direct comparisons to the top open players of the moment. Charlie Khan's experience in Chicago brought to the surface the difficulties of holding events concurrently. His first round upset of Greg Zaff in the Open event, and subsequent victory in the second round of the open over the fleet, much younger, Edgar Morales, gained Charlie a quarter-final berth, earned him a second substantial paycheck, and garnered for him enough ranking points to return him to the top twenty in the WPSA rankings. But this pair of hard-fought wins left him vulnerable in the Grand Masters draw, and he nearly lost to cousin Gul Khan and then fell for the only time that season, to brother Aziz. Aziz's loss to Caldwell in the finals returned Clive to the top spot three weeks after Charlie had claimed it. Another highlight in Chicago was the re-energized play of Sharif. A nettlesome tour topic had been the season-long travails of the great Sharif Khan, the tour's leading marquee name and still the sport's most popular and prominent protagonist even nearly a full decade after his reign had ended. There seemed an almost unbearable injustice in the way such current stars as Mark Tlbott and Kenton Jernigan, as much through chronological caprice as through their own prepossessing talents, were reaping the harvest of Sharif's heroic but severely under-remunerated decades of toil. And while throughout the previous season Sharif had reached every Grand Masters semi-final and thereby maintained flashes and some semblance of his eye-catching talents of yore, his winless performance this season, especially his feeble outing in Toronto, had so disheartened his populous following, that one Toronto-based reporter, his professional ethics yielding to the tug of his personal allegiance, had simply refused to include any reference to that match in his post-tournament write-up of the Canadian Open. In Chicago, however, Sharif would undergo a welcome revival, his play both in a straight-game win over Tom Rumpler and even in a spirited semi-final loss to Caldwell exuding an energy and creativity that it had been feared were gone forever. Sharif would go on to the semi-finals one month later in Los Angeles, and close out his strong late-season showing by winning the WPSA Veterans (45-and-over)title in New York, thereby conveying the reassuring message that, his years and nagging injuries notwithstanding, the noble Sherriff was still very much in the hunt. NEW YORK. After buzzing energetically through the mid-winter stretch, the 1990-91 Grand Masters Tour ended quietly at the WPSA Championships in New York. There in the palm-treed splendor of the Winter Garden setting, Charlie Khan repeated his Canadian Grand Masters final-round win over Clive Caldwell, whose consecutive tour victories in Chicago and especially Los Angeles (where Charlie had been a first-round casualty) had however already enabled Clive to clinch his second straight number one end of season ranking. New Jersey Champ Dave Talbott and Chicago finalist Aziz Khan were the other two semi finalists, and this foursome ended the year with the top four ranking positions as well. The Talbott brothers, who had co-occupied the winner's circle several months earlier in New Jersey, shared in New York the disappointing fate of suffering mid-tournament injuries which forced them both to default early in their respective semi-final rounds. Prudential-Bache, from whose generous support the Grand Masters tour had benefited so greatly for several years, underwent a corporate realignment during the spring of '91 and reluctantly decided to discontinue its squash sponsorship, a fateful decision from which the Masters Tour would never recover. Though 1990-91 therefore proved to be the last season of the Grand Masters tour, this unfortunate fact in no way diminishes the virtuosity of that period, which was defined by a unique mixture of burnished brilliance and nuanced nostalgia that was as rewarding to the players as it was uplifting to the spectators, many of whom had come to regard the rise and recession of this crop of fabled performers as a standard by which to chart their own monitor of time's relentless passage. And the still-magical touch of the brothers Khan, the doughty grittiness of Dave Talbott and Clive Caldwell's error-free consistency, molded the Grand Masters tour's identity and made it a captivating career opportunity for some, a joyous journey down memory lane for others and, by any measurement, a major and distinctive contribution to the promotional and entertainment value of the overall WPSA package and a key component of what came to be regarded as a special and unique time in the history of squash in North America.